Read the fiction of Brian Evenson and you’ll quickly find yourself enmeshed in religious fanaticism, inquiries into the nature of reality, and an abundance of violence. Evenson’s fiction occupies a rare place: he’s a prose stylist and occasional translator whose fondness for the raw joys of pulp fiction is undeniable. Some of his work veers into outright horror, while other stories adopt aspects of crime fiction: his recent novel Last Days is, at its core, a kind of riff on Dashiell Hammett’s Red Harvest, albeit one in which extreme body modification and warring cults factor heavily. Evenson’s fiction has many admirable qualities, and Contagion — originally released in 2000, and recently reissued by Astrophil Press — might serve as the best single introduction to his work. Ben Ehrenreich’s 2005 Believer essay “The Bad Mormon” or Peter Straub’s introduction to Last Days each do a fine job of establishing Evenson’s formidable credentials and supplying aficionados of numerous schools of fiction with a sense of, for lack of a better phrase, Why Evenson Matters. What you’ll find in Contagion is an excellent overview of Evenson’s strengths: the visceral qualities of his prose (and his penchant for viscera, period); the explorations of fanaticism; the ways in which pulp tropes are altered and remade. “Two Brothers,” which appears here and in recent editions of the collection Altmann’s Tongue, is one of Evenson’s most acclaimed stories, and it’s easy to see why: in telling an account of two brothers ebbing out of the larger reality following the death of their father, Evenson splits the difference between the visceral and the metaphysical and maintains a powerful and hallucinatory intensity. Elsewhere in Contagion, “Internal” takes the basic skeleton of a story of detection and uses it to raise questions of identity, motive, and familial fixations. Both the title story and “Watson’s Boy” take familiar settings — a frontier wasteland, a labyrinthine castle — and slowly infuse them with elements of the strange. More accurately, they take already striking settings and push their unsettling qualities to the forefront, resulting in stories that are both dramatically satisfying and philosophically challenging. The fact that this collection opens with a story titled “The Polygamy of Language” is an indicator from the outset that Evenson’s fiction mirrors religious obsession with philosophical obsession. From that story’s first sentence, he also establishes that both forms of obsession can and will leave bodies in their wake. Alternately: it’s an account of epistemology that ends in bloodletting. What makes Contagion and Other Stories so compelling, especially to a reader new to Evenson, is its accessibility. 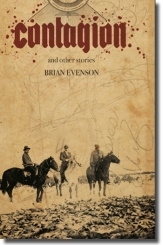 Evenson definitely has a more experimental side, in which language, action, and time itself lose their boundaries; while aspects of that are on display here, the work collected here doesn’t push the limits of narrative or rationality as much as some of the stories collected in the more recent The Wavering Tongue or Fugue State. Instead, you’ll find the raw power of pulp backed with an undeniable philosophical complexity — a combination that, in the eight stories found here, is powerfully compelling.